This state of the art centre doesn’t just offer visitors great shopping facilities - it offers them a complete experience filled with things to do, great eateries and plenty of activities and entertainment for the kids as well. With over 190 different stores, the spectacular Showcase Cinema de Lux and late night opening on Thursdays and Fridays, it’s the ideal place for a great day out. Westfield is the world’s largest listed retail property group with approximately £25billion of assets consisting of a portfolio of 119 shopping centres worldwide. Starting from humble beginnings (a sandwich shop opened by the founders in Sydney, Australia), the Westfield ethos of focusing on world class retail design and exceptional customer service has resulted in a multi-billion pound corporation that’s ambitious and continues to grow. The company puts a great deal of emphasis on customer service, and its staff and facilities try to make every customer’s visit as enjoyable as possible. And that includes the little ones. From the moment you park in a dedicated parent and child space, you’ll realise that shopping at Westfield Derby is designed to be easy and fun for all the family. The dedicated kid’s zone is located on Level 1 and features family-focused stores. You’ll also find activity area, Playworld and a dedicated Parent Room with a private area for feeding, bottle warmers, playpen, funky furniture and even child-sized sinks and toilets. Make sure you collect a free Kiddy Car from the Concierge team to keep your little ones entertained all day - just bring one form of ID along with you. And while you are there, sign up to the free Westfield Kids club for exclusive offers, events and discounts throughout the year. So what about the grown ups? 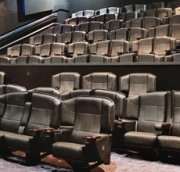 The Showcase Cinema de Lux is located on Level 3 and can seat 2,400 people across 12 screens. The luxurious Directors Hall offers film lovers the chance to relax in ultra-wide leather seats and enjoy a cocktail or snack before or after the film at the Directors Lounge. The full service restaurant, Studio One, offers a wide variety of food and full bar service with a menu that includes sharing platters, paninis, and delicious desserts. With screenings until three in the morning at the weekend, there’s always the chance to catch up on the latest Hollywood releases - the perfect night out for any film buff. If you’re looking for a great place to dine out, then Westfield has that covered too. From snack bars to coffee shops or the international flavours of the 800-seater Eat Central, there’s something to please every palate. The centre also has three fantastic restaurants, Nando’s, Pizza Express and Spur Steak & Grill. With a huge range of shops, from exclusive boutiques to well-known high street stores, some of the best restaurants in Derby and both kids and adults activities to keep everyone happy, Westfield has turned a day out shopping into an experience to be enjoyed.